After 4 rings will ring through to Personal below. Thank you for visiting Siebert Optics! Serving Large Observatories and the Amateur Astronomy Community alike. Eyepieces .965" / 1.25" / 2.0" / 2.7" / 3.0" / 4.0" / 4.3"
Large and Small Binocular Cleaning and Alignment services $99 Call or Email for details. 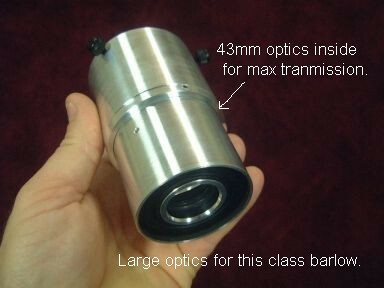 Large and Small Non Illuminated and Illuminated Cross haired eyepieces. 110mm Focus adaptors for any Application. Cameras/CCD/H-A/etc. Full Denkmeier service page. Repair services include all OCS and Power Switch repairs. We do complete alignment and Cleaning services. Short List>>>Apogee / Miyauchi/ Kowa / BT and many other Binoculars. Prices for cleaning and alignment starting at $99 Click here. 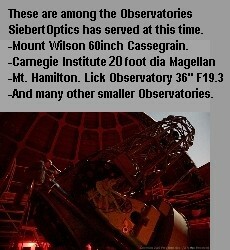 Siebert Observatory Series Eyepieces and Diagonals are being used in the largest visually capable telescopes in the world today. Look and see what these eyepieces can do for your Long Focal length Telescopes. Click here. The 25mm Black Night FMC. Read the info within and you will understand why Nothing even comes close. Watch this video "Click Here" ---More "Click Here.". Click here for the New 2" T-2 modular Barlows. Supercharge your Stellarvue, Williams Optics and many others like it. Do you want to share the same high End Binoviewing experience as those who own expensive models from the Big Prism Binos (TV, Denk, Baader) at a fraction of the cost. Do you already own one of the following binoviewers: Williams Optics, Orion, Stellarvue, Burgess, Celestron, Moonfish and Baader 23's etc..... Then you already have what you need to get started. Why pay $900+ For the privilege of using low power wide field EP's Click here for details. Home of quality, affordable Telescope Optics such as Eyepieces, Barlow Lenses, Image erecting prisms, Diagonals that focus. Low Power Illuminated Focusable Eyepieces, Special modified Binoculars. Camera focusing adaptors for all telescopes including the PST. Adaptors so your filters fit your eyepieces Adaptors so your Diagonals fit you scopes. and a variety of different size of high quality Binoviewers and OCA's for all Binoviewers (for comfortable two eye viewing) and other binoviewer accessories. More things of interest Delrin 2" 1.25" T - 2 or T thread End Caps. Please feel free to check out our site. If you have any questions, please feel free to ask either via email or phone (1-919-553-3980). Harry will try to answer any questions you may have as promptly as possibly. Click here to go to the OCA and binoviewer corrector page. Universal 1.3x and Zero mag OCA's above. This means you can use any binoviewer with little or no magnification added. Always see it here first. 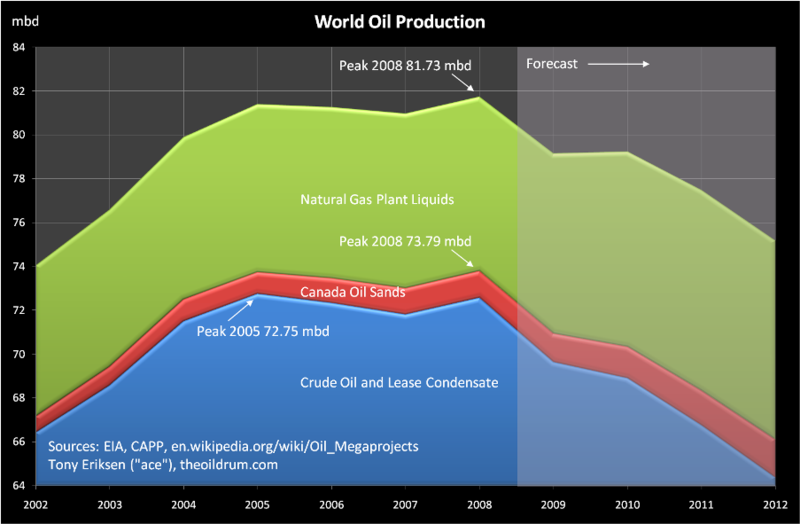 This technology, although similar to the OCS technology, has different characteristics and applications. Click Here to go to the PST and H-Alpha bino corrector page. Check out the Elite Series 2" binoviewers. What Will Binoviewer CLEAR APERTURE will buy you. 60 day money back guarantee on Black Knight units and accessories. Gift Certificates are available for any amount you may wish. Just email or phone and ask how you can obtain one. This site does not pay to have a secure tab in the address line. We protect or customers information by keeping our site simple. We do not have usernames or passwords to input on this site. Our online order forms are on a different system that is secured as you can see in the order form address tab. I police the site regularly for any changes which is a very effective way of protecting the content here. Page for All OCA's including Low power" correctors for Baader, Burgess, WO, Stellarvue, Celestron, Orion, Moonfish, BC&F, Binomate and the like. More info.. Here is the 2" Ultra barlows similar to the TV powermate. 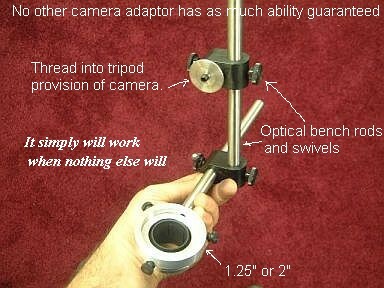 Also look at the new modular element barlows for 3 magnifications in one barlow. Universal Camera adaptors for both 1.25" and 2" focusers and your most demanding applications. These will work with any telescope-camera-eyepiece combination. Our 2" Observatory series are unmatched for the price in performance. Edge is flawless at F/5 and even below. The Ultra series are the perfect blend of Eye Relief and Wide FOV. Sharp in fast scopes and comfortable to look through. Try one you'll like them. Do you need an Inch" Check this out. Zero mag Camera Focus adaptor It will give you 1 inch of focus free of magnification. And help with coma. All listed products come with a 30-day money-back guarantee* unless otherwise stated. Specialty order items are not refundable (items made specifically for you).